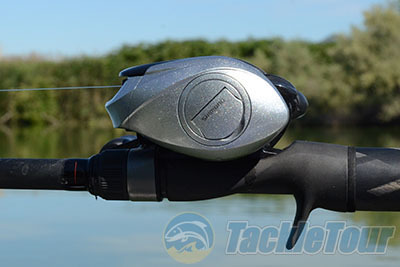 Introduction: When it comes to sheer mindshare there is perhaps no mainstream reel series that is better known than the Shimano Curado. This instantly recognizable green reel series has undergone changes over the years and yet it continues to be among the most popular in the segment. While the Curado no doubt still garners the lion�s share of attention there is another reel that is looking to step out of the Curado�s shadow, meet the middle child, the Citica G. The Citica G is sandwiched between the Curado and Caenan reels and was redone at the same time as the Curado G and bears the same exact profile and competes at the highly contested 129 dollar price point. We take a closer look at this aggressively priced reel to see whether or not it has what it takes to survive in the spotlight. Impressions: There are still anglers out there that miss the previous generation �E Series� baitcasters but controversy aside the new G series reels have continued to gain popularity since originally being introduced over a year ago. 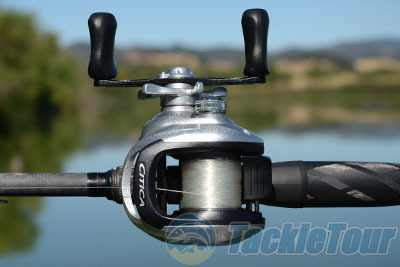 Anglers looking for workhorse reels have turned to both the Curado and Citica Series reels which are designed to deliver performance and reliability at a reasonable price point. 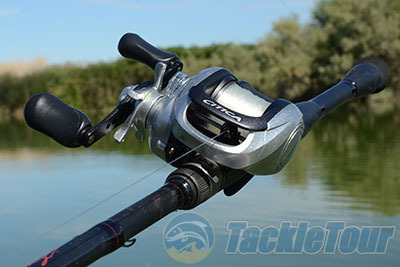 Unlike the previous model the new Citica G is available in the complete range of retrieve ratios which includes 5.5:1, 6.5:1, and 7.0:1, but unfortunately for anglers that prefer lefty reels only the 6.5:1 model is available in left hand retrieve. The Citica G features a two tone finish, and while it is reminiscent of the styling on the Caenan 100 the Citica G has a more subtle mild mannered look as the center is painted matte black versus a brighter color. The reel also features an anodized black handle which matches the grayscale motif and gives the reel a subtle yet refined look that will match easily with most rods, unlike the green Curado G which pairs best with traditional unfinished blanks or sticks that are painted green. 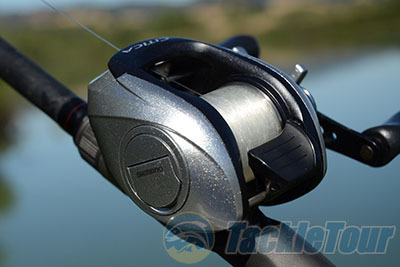 It makes sense that Shimano would choose this less polarizing finish for the mainstream Citica G series as this reel needs to appeal to the mass market at this particular price point. Real World Tests: Fishing has been tough this season with the low water levels and some of our favorite testing grounds have literally dried up. 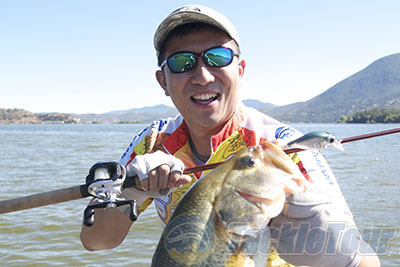 To test the Citica G we turned to our most reliable body of water, Clear Lake. Here the algae blooms started up early, and while the water was anything but clear it didn�t seem to bother the fish that were eager to take on both plastics and crankbaits. For fishing plastics we spooled the reel up with 12lb Toray Bawo premium Plus Fluorocarbon, and for reaction baits we used 12lb Trilene Big Game monofilament. In our tests we compared the Citica G the previous E version, and both the Caenan 100 and Curado G.
Casting: When Shimano creates a design feature that works it continues to leverage it for a long time and the Citica G makes use of many proven Shimano features including the Super Free bearing supported pinion gear and VBS (Variable Brake System) cast control system. The simple yet effective VBS system is among the most predictable and easy to adjust cast control systems on the market and Shimano makes it stress-free to access the brakes on the Citica G via the 1/8 turn easy access sideplate. 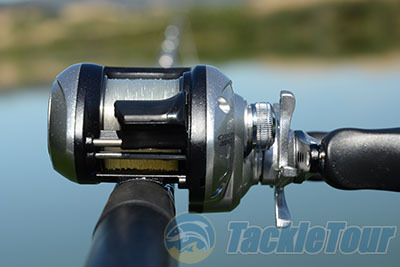 Once dialed in most anglers will leave the reel on either one to three brakes for the life of the reel, but it is good to know that you can access the system in the field quickly should adjustments be necessary. With both lightweight plastics and heavier cranks the Citica G casts quite well, so good in fact it delivers accuracy and distance that is near identical to the more expensive Curado G. The Lo-mass drilled spool starts up quickly and I found it very easy to pitch lures into tight structure with confidence. The cast control knob on the side of the reel may not click but it does feel quite solid thanks to a metal construction. Retrieving: The Citica G comes with only 4 bearings (3+1) yet feels surprisingly smooth and unlike the E Series where we felt the Curado E was significantly smoother than the Citica E the two G versions felt very similar. The delta in smoothness is relatively small and the biggest difference in feel is the extra leverage provided by the bigger power grips that are found on the Curado G. In comparison the Citica G makes use of the company�s more traditional barrel grips. There was a small amount of play in the handle shank of our test reel but overall the Citica G delivers exceptional cranking power. With many high speed reels there is a noticeable sacrifice in power when moving up to the 7.0:1 ratio but with the Citica G the HEG gearing still delivered plenty of power to muscle fish back to the boat. The high speed gear ratio allows anglers to power fish, hitting spots hard and fast and bring the bait back through unproductive water quickly in an effort to maximize casts. 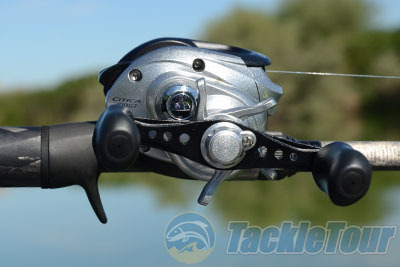 It is no secret that we really did not like the cranking power in the Caenan and thanks to the Citica�s aluminum frame this reel provides ample cranking power for working baits that create more resistance in the water as well as when bringing fish back to the boat. 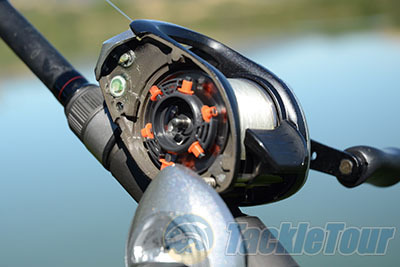 It is surprising how smooth and powerful this reel feels considering the handle side sideplate is constructed out of graphite, but the design just plain works. Next Section: Does the Citica G have staying power?